Unfortunately this video is not watchable in some parts of the world. 15 past ten and this is Kensington! I just get this message from Johannes de Boer, he says: "Lego World is unfortunately over. It were 7 very cool days!" And speaking about Lego. 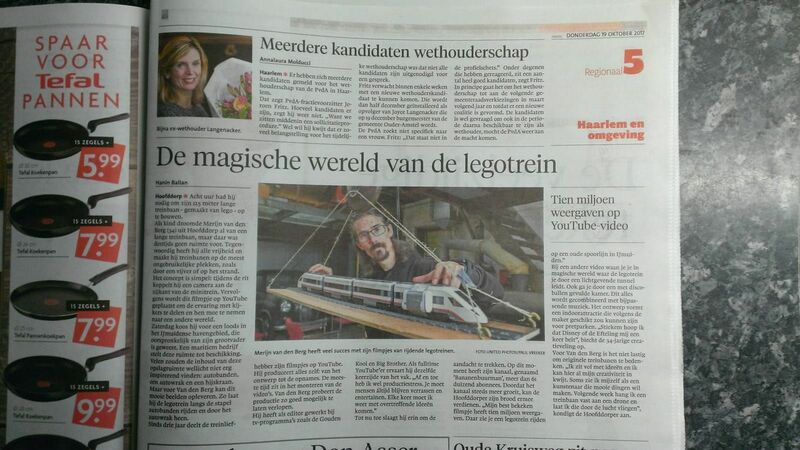 Merijn van den Berg really likes Lego trains. He even dedicated a complete Youtube channel to this! M: Hey there Kai good evening! K: Hey good evening! Is this an hobby that got out of control or...? M: Well, actually it was already out of control quite some years ago when I started with those trains. M: I came to live on my own and as a child I already loved Lego trains but of course, I had just a small track. And by the time I came to live on my own, I finally had the space to build a larger trainlayout, but still.. I just had a small appartment, so as a solution I hanged the complete trainlayout on the ceiling! K: Yes! That's what I saw! Those traintracks are running everywhere in your house! Doesn't that make you crazy at some moments? M: Yes, I bought 100 meters of tracks, and now I just lay a track outdoor on all sorts of locations. K; Ow yes, outdoor, but what if there are leafs on the track? Because that is always misery! M: Yes, no, this train doesn't bother. It's right on time and there are no leafs on the tracks! M: We are going to hoist the Lego train with this crane! K: Haha Yes that is also what could happen... You see a train getting pulled up with the crane, and then it just crashes in pieces! M: Yes! Such a luck! Exactly when those guys from SBS6 "Hart van Nederland" (Heart of Netherlands) came by, my train falls 3 meters down and shatters into pieces! K: Hahaha Yes Are you then long busy with repairing that? Because it broke down in thousands of pieces? M: Yes that takes some 10 or 15 minutes, especially in this case, because the pieces flown everywhere! K: But how long are you busy with such a world? And tell me how such a world looks like. M: Well of course I have all sorts of videos but what I try to do is work with the material onsite. so if there's a pallet with bricks, I create tunels with that, if there's a tube laying around, I'll drive the train through that. K: Ok, very creative, and how long are you busy with such a layout? on average because it varies per layout I can imagine. M: of which 3 days of building and 2 days of recording, and after that I also spent a couple days on editing to make it all look nice. K: Yes absolutely! Very good! But Merijn? do you also do something else in your daily life? or is this... are you dedicated? M: Yes that was very nice indeed! On a particular moment I had to make a choice if I would continue working for television or do something in which I could put all my passion and creativity. And of course I had that video of the Lego train on the ceiling, and that had become such a succes on Youtube, that I decided to do something more with the Lego trains. K: Ok, and you can live from that? All with Youtube? M: Yes, well, there are ads shown and once per thousand views or so I get a few cents, so yes, but it's not yet something I could complety live off. And that's why the channel needs to grow! That's why I want take this opportunity to ask everybody to subscribe to my channel for free, because the more subscribers I have, the more locations I can visit. K: Ok, Where can we see that? M: Haha, of course you understand that I have to make a little promotion for the channel! K: Haha, Yes you have done that already now! K: I'm closing the track! I'm going to put you on a side track! We're going the other way now! K: Thank you for your time and have fun with the trains Merijn van den Berg! Good evening!